Follow the Leader. . .
Hey, no cutting in line, Daphne. 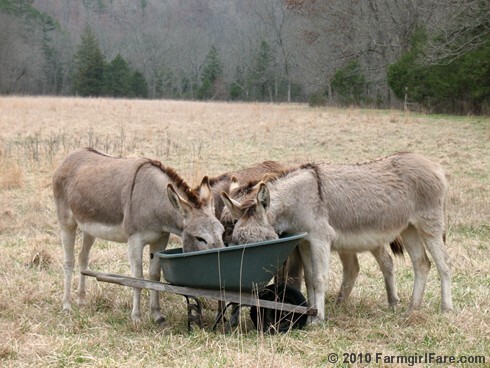 A broken wheelbarrow makes a perfect donkey treat trough. Speaking of eating, you know I always appreciate your feedback about this site, and I want to thank those of you who have recently taken the time to let me know that you miss the recipes that have been few and far between here lately. I miss them, too! I haven't stopped posting recipes; it's simply been a matter of time—or, more accurately, lack of time. I really love blogging, but I don't have as much time to devote to it as I would like. I'm also very picky about the recipes I share here on Farmgirl Fare, only choosing the ones that I really love and that I know work. I usually test a recipe several times before publishing it, and once I've finalized it and taken photos, it then takes me at least another four to five hours to complete the actual post. I'm also just finally (hooves crossed!) getting over the cold/flu/whatever I've had since early December, which has put me even more behind than usual with pretty much everything. Right now I probably have 20 recipes in various stages of completion (from Confetti Egg Salad and homemade Italian sausage to Raspberry Almond Crumble Bars and Meyer Lemon Scones), and every few days I plan to finish one. (February 2011 update: Woohoo! all those recipes are finally up!) Then something—or, more likely, four or five somethings—comes up, and before I know it, it's 9 or 10pm and I'm thinking, Well, I can at least put up a dose of cute, because they only take an hour or two. I know from your feedback (thank you!) that the Daily Doses of Cute (which aren't quite daily these days but hopefully will be again soon) are extremely popular, and that many of you stop by each day looking for a new one. This of course means that the number of non-recipe posts far outweighs the number of recipe posts. But what's going through my mind during those late night blogging sessions is that another cute post is definitely better than no post. That said, now that the most labor intensive part of lambing season is mostly over (though now we're dealing with a nasty viral outbreak that keeps spreading), I'm looking forward to having a chance to focus on the food portion of this food and farm blog, so I do hope you'll stick around. In the meantime, I'd love to know what you enjoy most (and least) about Farmgirl Fare, so please keep that feedback coming. Just leave a comment in any post or e-mail me: farmgirlfare AT gmail DOT com. © Copyright 2010 FarmgirlFare.com, the softly muted (except for the braying donkeys and the crowing roosters of course) foodie farm blog where these photos were taken in mid-March—and what a difference a month makes! 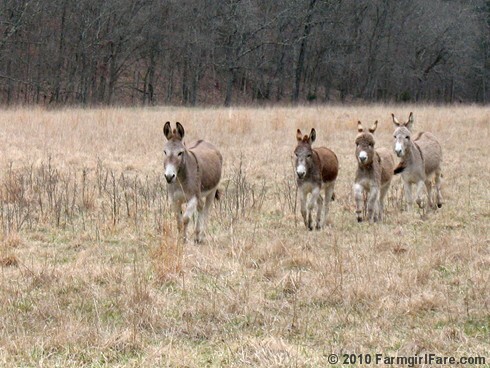 Everything in that field The Donkettes are in is now greening up and leafing out. And yes, in that second photo little Evie is indeed kicking her mother in the chest. 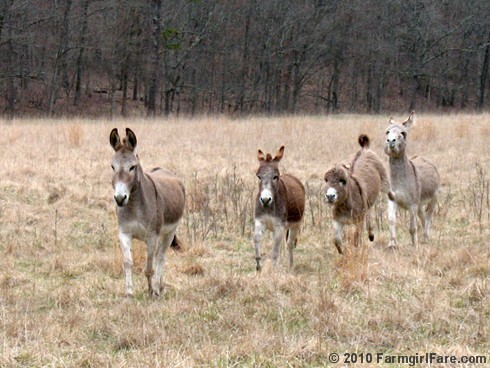 Love the way the donkeys walk in a straight line - even for food. In the Grimm/Lang/Calvino sort of tales, donkeys often produced something valuable -- check out the 'gold-dung donkey'. 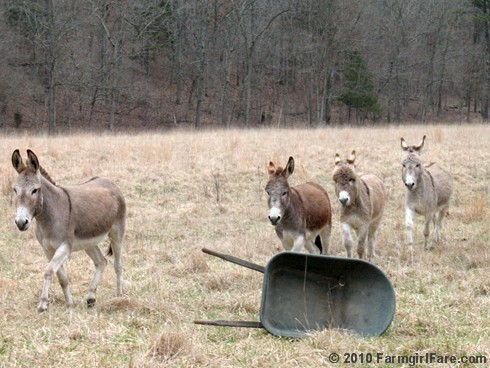 The word donkey means "Brown warrior"
My favorite posts are cooking and, on your other site, veggie gardening. I believe it was google and a "how do you freeze..." question that brought me to your site originally. I do also enjoy the daily dose of cute which I understand is much labor intensive. Very important since blogging isn't your day job. First off - I hope you continue to feel better. For me, I like the whole package - the food posts, the gardening and the daily dose of cute. I found my way to your site by accident - I had wanted to try my hand at baking bread using organic ingredients and came across your site during a google search. I like reading your posts and seeing the pictures and your food posts have inspired me to try things I wouldn't have thought I'd like but ended up loving. I think your bread baking tips were invaluable and as I write this, I have some Farmhouse White bread cooling off in the kitchen. Thank you! Hey Susan--well, I love everything about the blog, but I have to say, since I rarely have time to make a proper meal (dern city living! ), I definitely enjoy the farm life photos more. Keep up the good work! I like the doses of cute much better than recipes. I've used several of your recipes but I must say the bran muffins are a regular staple around here and are the best I've ever made. Many thanks for that. I have a vague memory of carrot muffins mentioned some time ago. 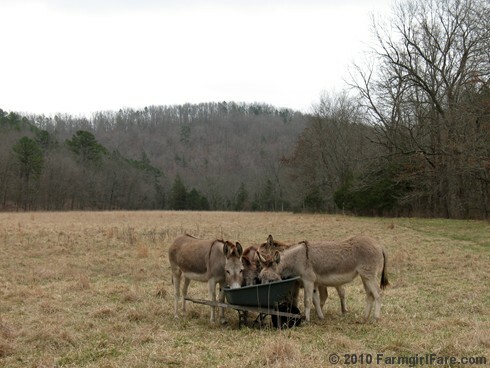 I just love seeing the photos of the farm and all the inhabitants and reading about your life. I enjoy visiting very much. Hope you're feeling well again very soon. Whoops, meant husband's delight. No polygamy going on here! Please edit!!!! If I have to make a choice between cute photos of the animals or recipes, I'm voting for the animals. Sorry, I'm not bashing the recipes cause they're great. However, as a city girl you are my source of animals and farm life. So keep it up! Well, I am totally here for the daily doses of cuteness of all the farm animals! Ha! I think I found your blog because of the recipes, but I like both the recipe posts *and* the daily doses of cute. Why do I love your site? Definetely the daily dose of cute. Because I plan to start up a farm and it's a insightful way to learn what I should expect with having sheep and barn cats, even if it's not always so cute. Post as you can, don't let them pressure you, your life and your time is what matters the most. We are just lucky to have people like you that are willing to share their life and stories with us! Thank you!! cute cute cute! not that I don't love me some recipes! the beer bread is a great go-to!!! keep yourself sane whatever way you need to...if cute works for you, then it works for me! Oh, Susan, I appreciate so much about you, and I have no expectations from you. I check your blog daily and love to read when you post, whether it's pictures of life on your farm or the amazing food you create. Yes, I often try your recipes, but the getaway from my life to yours is a real treat. I just noticed today that Seattle is leafing out in a big way! I come for the dose of cute, I admit! Susan, I too check your blog daily. I love reading what you have to say; if it's a recipe---okay; if it's about farm life---good. I especially enjoy your photography; oh, to be so talented. Hope you continue to feel better. Thank you. I love your blog no matter what you post. I adore the donkeys but love all the animals. I have tried many of your recipes. I kind of like it the way it is...am happily surprised when I visit! Feel better soon and thank you for all lthe smiles you bring to your readers! I subscribed for the food and love when you post recipes but I have thoroughly enjoyed the farm pictures. I do find myself laughing and smiling at the animals. I miss getting out in the country which I was able to do almost weekly growing up! Your site reminds me of those days. Thanks for all the hard work and your sharing it. Hope you continue to recover well. Hi Susan - I love, love, love your blog - no matter what you post. Recipes, adorable daily doses of cute, Hunky Farm Guy, heart rocks, landscapes...whatever...it's all wonderful! I, too, hope you are feeling better 'cuz everything is harder when you don't feel well. Thank you so much for sharing your amazing farm life with the rest of us. You are so generous and we are very lucky! I tried your chocolate chip toffee shortbread cookie recipe last week and loved it! I did however use full size chips since they were on sale! I have bookmarked other recipes I hope to try, thanks! I just read in your post that you've been sick for awhile, and then later I came across this news story---please take a closer look! It talks about an outbreak of a rare disease that affects people, usually around goats...I hope this isn't what you've had. I love all the aspects of your blog be it delightful pictures or delightful food. A good bit of what keeps me coming back is the fun insight into your farm life-style that you present to us in your very own lighthearted tone of voice. Keep up the good work! They are very cute! I love all your posts! Love the daily dose of cute-- seeing the animals (and the beautiful countryside and heart-shaped rocks) lift my spirit. For me the recipes are just icing on the (Emergency Chocolate) cake-- great to have, but there's a whole sidebar of recipes I'm dying to try. Feel better, and keep the cute coming! Susan, I have to say (and I know I am biased!) that there is always variety on your blog and even when there are a few days between posts, there are so many old items to read or read again, that I never get bored with the content. I think it may have been during a previous lambing season when, in search of something 'less lamby', I trawled through your tales of moving to Missouri, the hilarious 'Writings from Windridge' - it was then that I came to appreciate your site as your writing was/is truly entertaining. I enjoy every visit on your site. I found it because of the recipes, saw the cute-photos and fell in love immediately. They are awesome. You do such a great job. Please keep on posting whatever you like. I check on cute nearly every day but I like the recipes as well. 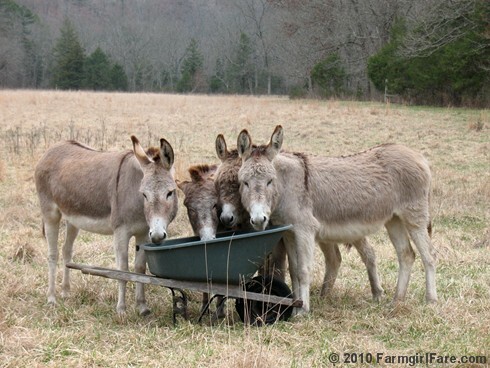 yours was one of the first blogs I ever read years ago...can't remember what brought me here in the first place...but I love it all, recipes, farm life, dogs and, above all, the donkeys! Keep 'em coming...and look after yourself. I enjoy everything that you post! I actually don't check daily, I let the posts build up, so that when I have a few spare moments or am having a rough day, I can take a break looking at cute pictures, yummy recipes or funny stories. I tried blogging daily for about a year and it's far, far more difficult than I would have thought! And that's with a high speed internet connection and plenty of time during the day to put something up. So kudos to you! As someone who dreams of farm life, I also really appreciate when you get into the nitty gritty but if you did that on every post, it wouldn't be the blog that it is! So I love the balance and no matter when you post, you are making quite a few people smile...feel better soon!! !